Crack—the smokable, freebase form of cocaine—was first introduced to the market in the late 1970s and quickly decimated inner city neighborhoods for much of the 1980s and 1990s. The cheap cost of this drug makes it accessible even to the poorest addicts, and this may help explain why crack can destroy lives so quickly. Crack is so immediately addictive that many addicts have even theorized that it was developed and disseminated as part of a government conspiracy. A “creepy-crawly” sensation on the skin (known technically as formication, a word derived from the Latin for ‘ant’, as stimulant abusers frequently report feeling like bugs are crawling on and under the skin). Multiple organ injury, including muscular breakdown (rhabdomyolysis) and kidney damage. Chronic cardiovascular issues such as congestive heart failure, high blood pressure, strokes and heart attack. New or worsening mental health symptoms. Infertility, loss of libido, impotence, and other forms of sexual dysfunction. Concomitant crack and alcohol abuse has been linked with the exacerbation of oral lesions, sometimes leading to cancer. Coma, seizures, and sudden death. Crack addiction is itself a disease that begins with mild to moderate cravings. Over time, these cravings can overtake your life, causing you to neglect that which matters most to you. As your chemical dependency gets stronger, the intensity of cravings increases. Most people begin using crack to get a quick high or a relief from the stress of everyday life. But from your very first use, your body begins changing in response to the drug. Cravings may be relatively minor at first, but when stress kicks in, the cravings can become intense. Over time, as your chemical dependency gets stronger, the intensity of craving increases. can still be dangerous. Many users accidentally overdose on crack as they steadily increase their dosage, desperately trying to get the same high they once got with a smaller quantity of the drug. Tolerance quickly gives rise to dependence. With prolonged and regular use of crack, biologic drives can convince you that you need the drug as much as food or water. The scary part is that there's no way to predict how long this process will take. Some users take months to become dependent, while others are dependent within a week or two of trying the drug. Dependency positions the drug as the most important part of your life, and can result in you giving up even the people and things you love the most for just one more fix. Withdrawal is the painful result of chemical dependency. When you suddenly remove crack from your body, your body can react almost as if you've stopped eating or drinking. Symptoms range from lethargy and relatively mild anxiety and headaches to intense psychological and physiological pain. If you have other health problems or a long history of addiction, you may even suffer life-threatening symptoms, such as suicidal thoughts. Recreational crack use can quickly escalate to full-blown addiction. If you find yourself trapped in a cycle of craving and dependence to crack cocaine, call 1-888-993-3112Who Answers?. 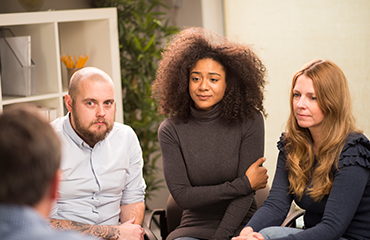 Our treatment support team can provide information about a variety of crack addiction recovery programs to those who need them. Find Support Narcotics Anonymous is a 12-step support group that helps people who are addicted to crack and other drugs. Locate a meeting for you or your loved one. Crack addiction isn't something easily compartmentalized away from the rest of your life. Your crack addiction will eventually influence every area of your life. Addiction is, almost by definition, an all-encompassing ailment. Even if you're able to control your cravings now, eventually they will distract you from your values, goals, and those you love. Women who are pregnant while using crack may set themselves up for a lifetime of suffering if their children are born addicted to the drug, or with drug-related birth defects. Because crack is both illegal and has the capacity to induce aggressive behavior, use of this drug exposes you to the risk of violence from drug dealers and other users—far more so than most other illegal drugs. Exposing you to legal, financial and health risks. Causing you to hurt the people you love the most. Contributing to the development of new or worsening mental illness symptoms. No one willingly chooses to become an addict. After all, who would choose endless hours of misery? For many people, though, crack addiction is a way of masking and self-medicating the symptoms of mental illness. For people with depression, the stimulating effects of crack are hard to resist. The escape crack provides can make it a tempting option for people with other mental illnesses. Because crack is a stimulant, it may also induce manic episodes or psychosis. Some users even experience dangerous hallucinations that encourage them to make risky decisions, such as climbing a building or engaging in a fight with a bystander. The pain of mental illness is challenging enough to deal with on its own. When crack is added into the mix, things can get even worse. Painful withdrawal symptoms can compound mental health issues, convincing addicts to continue using, even in the face of terrible consequences. It's no wonder, then, that about half of people with mental illness eventually develop an addiction. The good news is that you don't have to live with a crack addiction forever. Treatment works, and the first step to getting better is simple: simply admit you have a problem and seek help. Many who abuse crack are suffering simultaneously from both physical and mental health conditions. Specialized treatment centers are equipped to handle all simultaneously. For more information about just such a crack addiction treatment program, call our toll-free line at 1-888-993-3112Who Answers?.